Disenchanted single mom Jennifer Cullen is a Scroogette when it comes to anything Christmas. Even her six-year-old son, Brian, is having trouble believing in Santa Claus. But when her Uncle Ralph visits and brings a fellow passenger from his flight, Jennifer’s dubious heart awakens to the possibility that Christmas really does hold miracles. A definite Must Watch movie – had to get this on DVD so could watch again and again. Love Henry Winkler and have grown to love Brooke Burns in her many Hallmark movie rolls. Would also Love to see a part two also!!! Morgan and the little boy now grown up I’m sure. Would love to see the ‘story continued’ . . . . maybe even that they had more children. Oh the fun . . . I LOVE-LOVE-LOVE this movie! “The Most Wonderful Time of the year” is the Greatest ever!!! 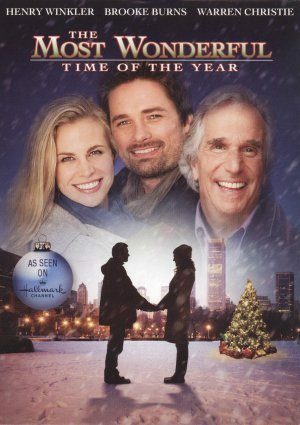 Best Part is: When Henry Winkler-(Former “The Fonze”) brings some of “Fonzie” back into the scene where Brooke Burns heads to the airport to find Warren Christie on the prompting of Henry Winkler and Henry sets back on the steps and “Says: “Now this is my kind of Christmas” and puts his fist down like “The Fonze” would do! The Producer and Henry Winkler NAILED THIS MOVIE at that moment!!!!!!!!!!!!! Love you Henry Winkler! I use to skip school only for your show in high school****** Lol!!!!!!!!!!! On wish there was a part 2..let’s see what happened with her relationship with morgan.. This is definitely my favorite! I could watch again and again! I really enjoy watching. “Its The Most Wonderful Time Of the year” Please Show it more than twice on the Christmas in july line up and during the Christmas holiday season. Thank you! Why can’t I down load it’ the most wonderful time of the year-2008 with Henry Winkler? I have an iPad. Thanks Connie F.